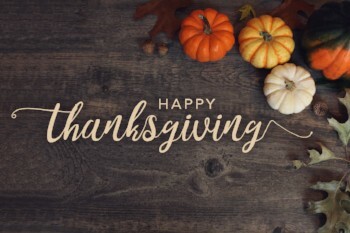 Corb7 International November 21, 2018 Newsletter | Corb7 International, Inc.
We wanted to take this opportunity to wish our friends in the United States a very enjoyable holiday. Without your support our publications would not be possible. Thank you and hope you have a safe and enjoyable holiday. Thanksgiving is celebrated each November in the United States and each October in Canada. People traditionally gather around the dinner table flanked by friends and extended members of their families to give thanks for the blessings they enjoyed throughout the year as they dig into a delicious feast. Turkey is typically the centerpiece of the Thanksgiving meal. 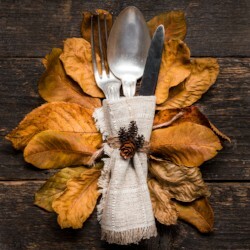 Although turkey can be a delicious and nutritious addition to the table, individuals looking to expand their culinary horizons may want to borrow from the other foods believed to have been shared among the Plymouth Colony Pilgrims and Wampanoag natives during the 1621 feast that inspired Thanksgiving. Wild turkey were available in abundance in the New World, but historians believe that, during the first Thanksgiving meal, participants likely feasted on waterfowl instead of turkey. In fact, turkey wasn’t common Thanksgiving fare until after 1800. Waterfowl, according to National Geographic, includes ducks, mallards, swans, and geese. Those looking to experiment can take a break from turkey and make duck the centerpiece of their meals this Thanksgiving. Plymouth, Massachusetts, is located where Cape Cod Bay and the Atlantic Ocean meet. As a result, indigenous people and the pilgrims likely relied on the bounties afforded by the ocean for their sustenance. Documentation of the first Thanksgiving by pilgrim chronicler Edward Winslow indicates lobster, fish and clams were likely served. People who enjoy seafood or those who prefer to abstain from meat or poultry can embrace seafood at their Thanksgiving gathering. Fruits native to the region where the first Thanksgiving took place included blueberries, plums, grapes, gooseberries, raspberries, and cranberries. Cranberry sauce was an unlikely menu option because sugar that traveled over on the Mayflower was probably depleted by November 1621, according to History.com. Also, cooks didn’t begin boiling cranberries with sugar until about 50 years later. To recreate the first Thanksgiving, enjoy raw fruit as a tasty dessert, which can be healthier than sugar-laden sauces. Vegetables to enjoy include onions, beans, spinach, cabbage, carrots, and corn. Corn was likely turned into cornmeal and pounded into a thick corn porridge. Experimenting with a cornmeal recipe can liven up this year’s festivities. Plant roots found in 1621 included parsnips and turnips, and not the popular potatoes that often accompany turkey at modern Thanksgiving gatherings. The potato was not yet popular enough among the English to warrant space on the Mayflower as it made its way to present-day North America. Purées of parsnips and turnips can be delectable on their own or used as a basis for a Thanksgiving soup. Although pumpkins and other gourds were available in the New World, baking was not yet popularized because of the lack of wheat flour. Instead, it is possible pilgrims would hollow out gourds, add spices with milk and honey, and then roll the gourds in hot flames to form a sort of custard. Home cooks can replicate a pumpkin custard in their kitchens and serve it in lieu of pumpkin pie. Turkeys are seemingly everywhere come November, whether it’s at your favorite grocery store, on television cooking shows and possibly hanging out in the wild of a nearby nature preserve. Turkeys are the main course for many holiday dinners, and turkey leftovers also make for popular meals once holidays have come and gone. Although turkeys earn most of their attention during the holiday season, their health benefits can be enjoyed throughout the year. Turkey contains roughly 34 calories and 1 gram of fat per ounce (33 grams) of meat. It is low in saturated fat and is a good source of protein. 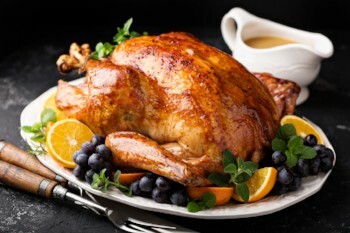 In fact, just one 3 to 4 ounce serving of turkey provides 65 percent of a person’s recommended daily intake of protein. Protein helps fuel the body and can help a person feel full longer. People who are customizing their diets to protect against cancer may want to include turkey on the menu. Turkey contains selenium, which can promote healthy function of the thyroid and boost the immune system. Selenium also helps to eliminate free radicals in the body through its antioxidant power. Those who need to increase their B vitamin intake also can turn to turkey. According to Livestrong, a serving of turkey has 36 percent of the daily allowance of vitamin B3, which helps process fats in the body. It also contains 27 percent of the RDA for vitamin B6, which helps maintain steady blood sugar levels, among other things. In addition to these vitamins, turkey also is rich in many minerals, including iron, phosphorous, potassium, and zinc. While turkey is healthy, the way it is prepared can affect just how beneficial it is to one’s diet. For example, slathering the meat with butter or dousing it in rich gravies may negate some of turkey’s positive attributes. 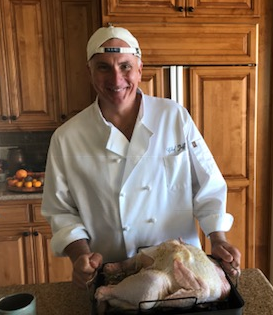 One of the most popular ways to cook turkey is to roast it. Let fresh herbs and a citrus juice marinade add the desired flavor. Place the turkey on a roasting rack so that any fat will drain to the bottom of the pan. Baste the turkey with fresh marinade to keep it moist. It’s best to cook any stuffing outside of the turkey so there is no potential for contamination by bacteria. Make stuffing healthier by using whole-grain rice, vegetables, dried fruits, and nuts in lieu of a heavy bread base. Leftover roasted turkey can be ground and used to make tacos and burgers or chopped and turned into turkey salad. The possibilities for leftover turkey are endless, especially for cooks willing to try their hands at something new.